Another awesome shoutout from our friends over at Sounds & Vision! 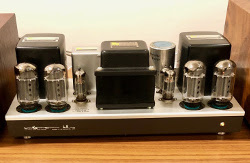 "A couple weeks ago New York City’s Stereo Exchange expanded its operation to include the used audio gear bought, reconditioned, and resold under the “certified pre-owned” label by NJ-based SkyFi Audio. SkyFi Audio’s latest arrivals include a stunning Garrard 301 turntable with an equally stunning price of $8,999. The table features a custom plinth and SME 309 tonearm." SkyFi Recently Featured in Sound & Vision Magazine!